Camping can be a fun time to spend with family and friends, but most people forget that it’s not always as safe and secure as they tend to believe. Camping in the wilderness has its own risks along with the fun we can have. This doesn’t mean that you will necessarily suffer an injury, get bitten by a spider, be attacked by mosquitoes or lose your trail back to the campsite. All of this means only that if you’re well prepared you will more easily handle the situation. You will know exactly what to do and how to fix the problem. You will also be mentally prepared to face a difficult situation without the useless panic. Apart from having a camping first aid kit, you will also have the coolness and calm attitude necessary during such incidents. And remember that preparing for an incident doesn’t mean that you’re attracting it. It only means that you have a plan B and you know how to help yourself, your family and most importantly, your kids. Along with these sanitation items, it’s good to have cotton balls, anti-bacterial cream, sanitary towelettes and hand gel/soap (useful before you go applying any of the above bandages and pads) and lastly, get alcohol wipes (for sterilization). Pick also a lip balm with a UV protection factor, because even if you go camping in the shadows, strong sunlight will hurt your lips and they will feel painful for a few days. To protect them, use the lip balm. This also applies to your skin, so bring a sunscreen if you’re out there during the warmer months. Find a suitably large plastic bag which has a zipper and efficiently keeps water away from your emergency items. Once water gets in, or they get even remotely damp, they will be useless. Don’t forget to add all your medications, which you and your family members need on a daily basis. To these add painkillers (Ibuprofen, aspirin, etc), medications against diarrhea or nausea (e.g. 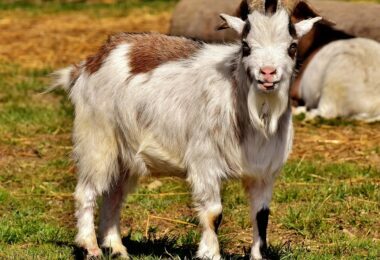 Imodium – it also slows down dehydration) and also antihistamine-based medication (against common allergies). Good over-the-counter antihistamine is Benedryl. Painkillers also have the additional effect of reducing an inflammation and alleviating fever symptoms. Make sure that you check these medications regularly and if any of them has expired, throw it away and replace it with a new item. 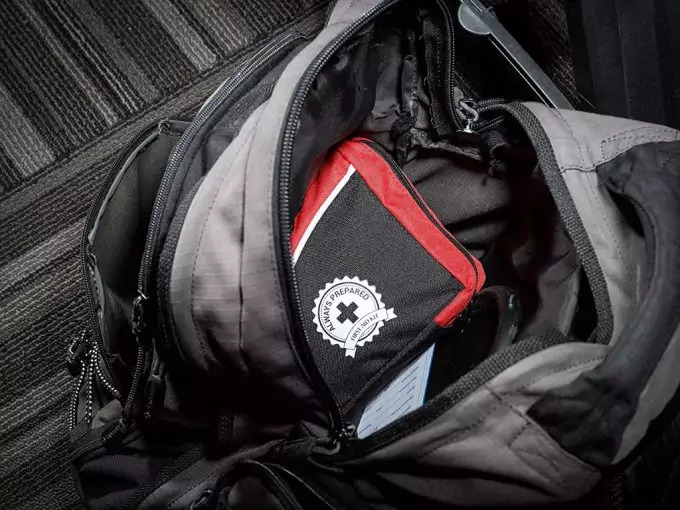 A good tip is to carry a bit extra of these medications and when you go on a trip but forget to look in your first aid kit, you will be happy to see these extra drugs, just because you’ve oversupplied the last time you checked. This will also save you time on preparing for your camping. In another compact plastic bag, place different types of instruments useful when handling any of the above bandages and/or pads. Find some clean tweezers, small pair of scissors, safety pins, and optionally you can add a thermometer (digital; not mercury-based) and a magnifying glass. These can all be handy when handling cuts and wounds. Read our article on how to tell if a cut is infected to give you all the knowledge you need. Also, you may need to handle burned skin so get some anti-itch cream or a spray (if in contact with poisonous animals, insects or plants), burn relief cream/spray and also petroleum jelly (very good for chafing). Such medications are After Bite and Hydrocortisone Cream (1% concentration). When it comes to cleansing wounds, it’s good to have in your first aid kit an aloe vera gel or spray. It also helps cleansing an open wound, has anti-bacterial properties and also helps for burned skin, by relieving the pain and itching. It won’t work unfortunately if the burn is really serious. Ordinary traditional Vaseline also helps to soothe a wound and apply it on the dressing. Some experienced campers also use super glue sometimes, especially for deep (to the bone) cuts. 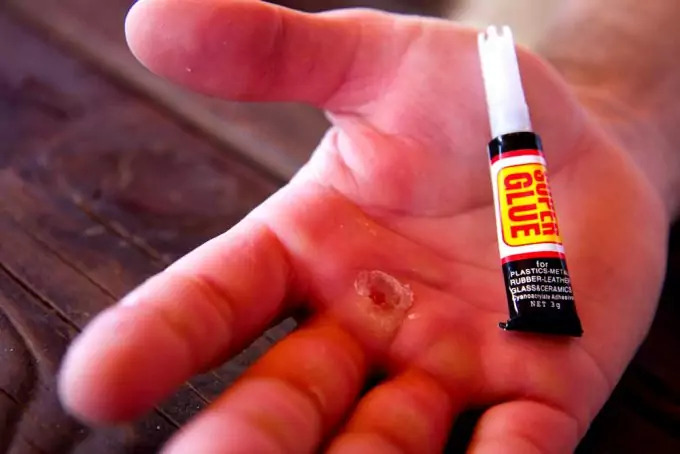 You can use the super glue to attach the skin pieces around the wound so that it’s protected from exposure to dirt and can also help the wound heal faster (because it’s protected). You also are virtually safe from infections because the seal won’t let any bacteria enter the wound. Of course, you should sterilize the wound before using the super glue. It’s isn’t toxic so you’re safe to use it. Don’t glue the inside of your cut skin – only the top skin. (As an aside, you can use the super glue for other cut or damaged items in your campsite, like boots or clothes). To be sure all of the above is handled properly, get yourself sterilized gloves (disposable), pocket flashlight (if you need to help someone during the dark hours) and prepare a first-aid kit manual. You can write it yourself, or purchase one. Already made manuals contain different types of incidents that may occur in the wilderness and also the way to administer medications or sprays and how to handle the situation as a whole. One useful way to make sure that your plastic bags with all the necessary items won’t get wet or no water can leak in, is to place the bags in a water-tight plastic container or box. You will prove double protection against moisture and water. Apart from the above sanitary items, it’s also good to consider your drinking water. 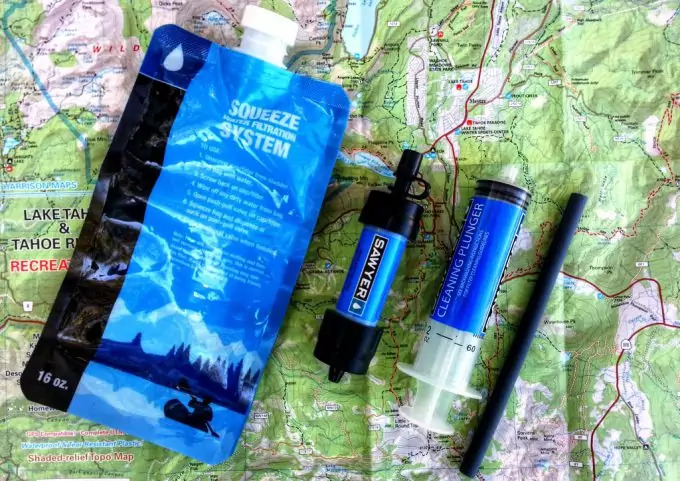 If you carry enough in your van or backpack, then you’re fine, but if you run out of water, or for some reason you need to drink from a river or lake, it’s never a good idea to just get there and drink. There are microorganisms and viruses, which can often lead to sicknesses, diarrhea, nausea, poisoning, etc. To avoid these unpleasant and often fatal consequences it’s best to carry a filtration or purification system. Today there are very small, efficient and light-weight systems of this sort, which can provide you with clean fresh odorless water. Most such systems claim to deactivate any microorganism in the water, remove impurities and dust particles (filters) and also remove any unpleasant smell or taste (including color) the water may have. There are also purification tablets, which weigh so little that it’s almost insignificant. These do not remove the dirt and particles, but deactivate living organisms and viruses. It’s best to consider one of these options, or even both in combination would work perfectly. Take a look at our article on the best survival water filter to make your water safe and potable. 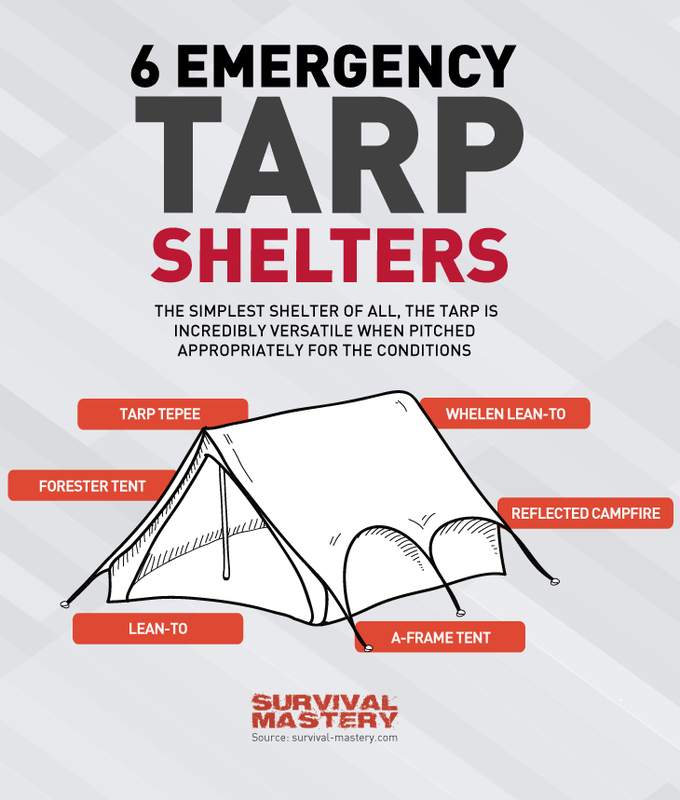 Even if you are camping in your van or car, or in a safe family tent, you must be prepared with an additional tarp for emergency sheltering. This could be useful if you decide to go hike a bit in the area with your spouse or kids and suddenly it starts raining or you lose your way back to the campsite. You can then use the tarp to protect you from the unpleasant weather conditions. Don’t underestimate the whims of the nature. You can also use a tarp or space bag in the cases when someone is very cold and there is the risk for hypothermia. Aluminum blankets have the ability to insulate you well enough so that even a hypothermia victim can, with time, get warmer and evade complications. If you’re driving to your campsite, you should also get enough warm blankets (even if it’s summertime). These can be extremely helpful during sudden drop of the temperatures and with hypothermia victims. Of course, don’t forget the ponchos. Although you may have a reliable shelter or tent, it’s always a good idea to have a poncho in your backpack wherever you go trailing nearby your campsite. Again, weather can be unpredictable and you don’t want to take any chances. For the best survival tents, see our previous article. Don’t expect that wherever you go camping you will have a perfect blissful experience. 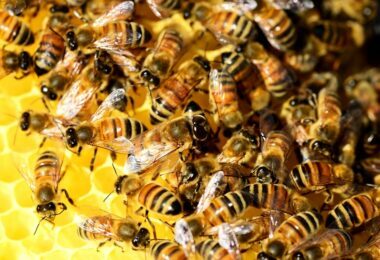 You should be prepared for mosquito attacks and other annoying buzzing insect, including more aggressive bumblebees and wasps. 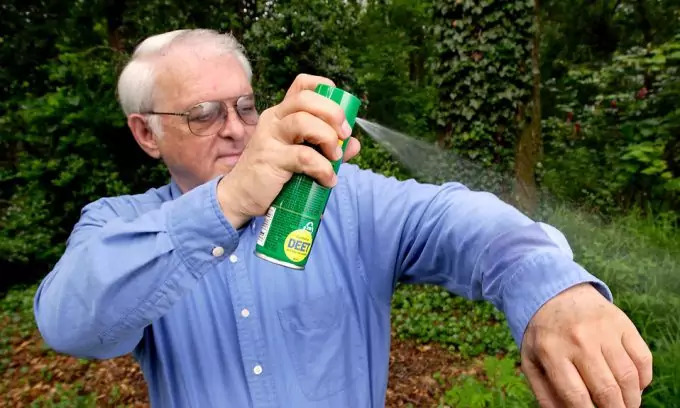 This is why you will definitely need a bug repellent or even DEET-based spray. Of course, be careful how much you apply on your kids, since their skin absorbs much faster and still hasn’t developed proper defense system against chemicals. Make sure the repellent can protect you from stinging insects and mosquitoes. If you don’t like to spray yourself with chemical solutions, find burning candles – insects and mosquitoes tend to dislike smoke and will leave you alone. Of course, burning a campfire will do the same job. Also, if you have irritable eyes or tend to have allergy against pollen take care to have eye wash or drops which can keep your eyes refreshed and cleansed. Eyes tend to gather small particles, including pollen and they can get very irritable and itchy. To avoid this unpleasant reaction, make sure you have appropriate eye drops for such situations. This is applicable to any member of your family or group. What if you don’t want to spend time on collecting all these items yourself, but would rather purchase one which is already prepackaged? There are hundreds of products online and in stationary shops where you can find what you need. Here we will offer you a list of some of the highly rated and trusted products among campers. This item is currently a bestselling item in the camping category. It features all the above items we talked about in the previous section. All of these are stored in a comfortable storage bag, which takes little space and weighs about 9.6 ounces. 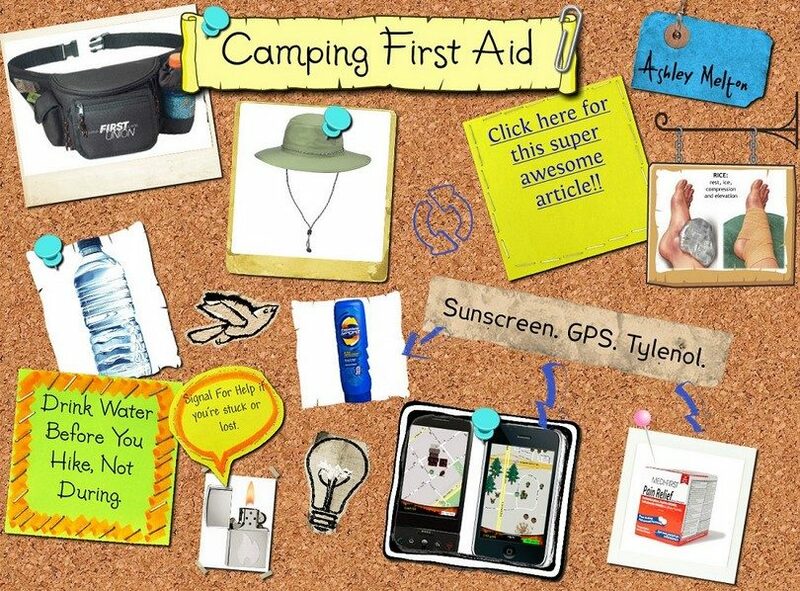 This is a very basic camping first aid kit, but will serve you perfectly for minor injuries. Although you won’t really have painkillers and antihistamines, it’s best to add these in your own special plastic bag and place a note that these are your medications during your camping experience. Any additional medications or medical items should go in that bag without mixing it with the remaining items in the first aid kit. 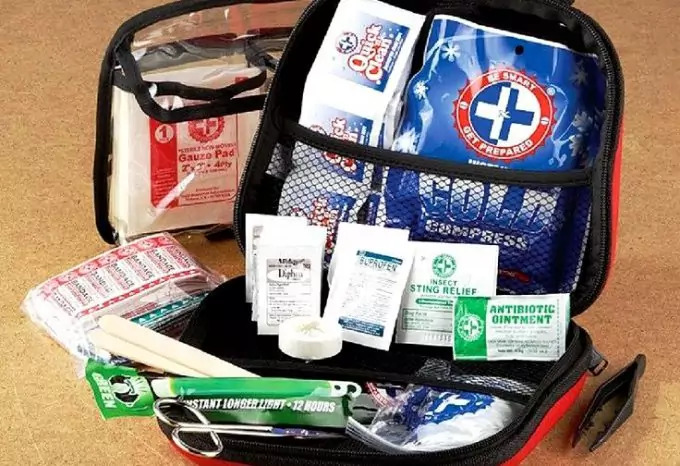 Overall, this medical kit will get you ready to see a proper clinic or medical personnel. Until then you can rely on the items in this kit to get you as safe as possible. Most customers are more than happy with this product and highly surprised how many items there are in such a small, light and compact bag. This camping first aid kit is slightly larger and weightier, and the reason is that it includes a bit more than the above first aid kit. You will find loads of adhesive bandages (almost all possible types of bandages from knuckle to butterfly bandages), finger splints, tape roll, gauze dressings of different sizes, trauma pad, disposable gloves, cold compress, scissors and tweezers, sanitary and antibiotic cream, prep pads, towelettes, iodine pads, relief pads, emergency light stick, whistle and water pouch, including non-aspirin tablets, electrolyte tablets (in case of dehydration), antacid tablets and on top of all that an instruction manual. There is also space for you to add some more items and medications if you want to. It’s totally customizable if you know what you’re doing. Otherwise, this kit can offer you help from small to more serious injuries (unlike the first item). If you add a bit more items you think are useful, you can be entirely covered by it. The only thing you need to consider before fully relying on this first aid kit is to test if it’s water-proof. Some customers report that sometimes water may leak in through the zipper, so if you want to be sure none of your valuable items gets damp, place these in seal-able plastic bags, which let no water or moisture inside. In addition to that, the bag is made of hard case, which means it will protect your valuable items better. There’s a shoulder strap as well. It’s very easy and comfortable to carry both on your shoulders and in your hand. Although this kit is often advertised to trekking enthusiasts, it’s also a perfect addition for a family or group of friends gone camping. 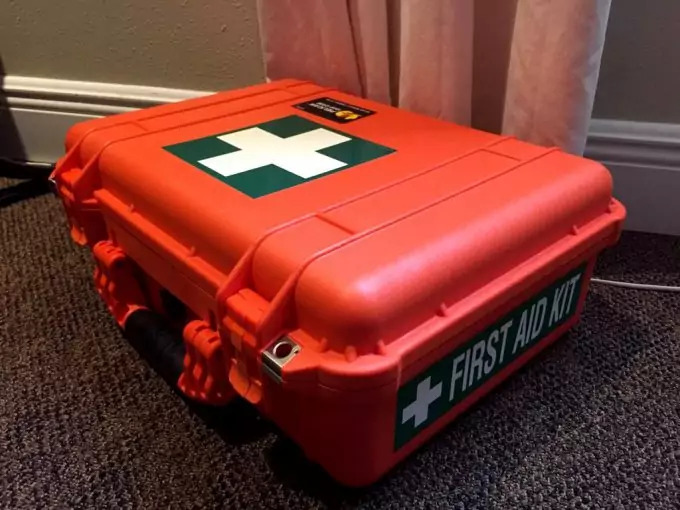 This kit includes all of the needed items, but much more than the above – it is a great preparation kit since it is packed so that it can cover all your family or group members. It is slightly heavier as a result and takes a bit more space than the above products, but you can at least be sure that it will serve its purpose. You can refill all the items that are already used and thrown away, and even keep an inventory of what needs to be replaced. The bag is of hard casing and can sustain some amount of force or pressure. The only thing it doesn’t contain is medications and/or painkillers. So again, you are required to do that yourself. This is understandable since different people require different medications, and also because the product itself may not have an expiration date like medications do. After all, medications and drugs in your first aid kit must be replaced often, without exception. In the end, it’s good to talk a bit about the instruction guide that it’s good to have in your camping first aid kit. You should either purchase a pre-made instruction guide or make your own. A good item is the Emergency first aid treatment guide. You will learn how to be responsible about your health and the health of your companions. You will also learn about safety procedures and how to handle broken bones, frostbite, stroke or heart attacks, etc. You will also get the latest updated version by the American Red Cross. 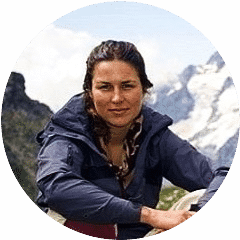 The guide also supplies you with all necessary emergency phone numbers so wherever you go camping you will know which phone number to call. You could also write your own guide, but you will have to consult professional medics to be sure you’re writing the instructions correctly. And finally, even if you’re just going camping any incident may happen and you must be prepared. It’s a great idea to earn a first aid certificate so that you can be sure nothing can go wrong under your supervision while you’re all camping. The Red Cross and other health organizations offer such courses, so find one close to you and enroll. Also, be smart and learn the risks in the particular area you’re going camping. The preparation at home and knowledge about where you’re going is half the protection you can get. 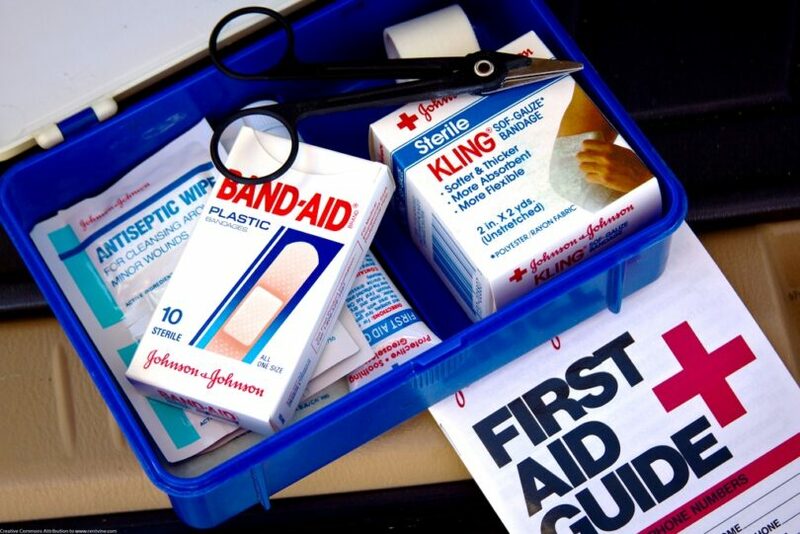 Your first aid kit should handle the rest. Get yourself ready – read our article on how to assemble the best bug out bag to ensure your survival.